Three short novels were released under the banner of “Journey to Star Wars: The Force Awakening,” each one concerning one or more of our heroes from the Original Trilogy, such as Luke Skywalker, Han Solo, and Chewbacca. We have previously reviewed The Weapon of the Jedi and Smuggler’s Run, now we turn our attention to the final book in the collection, Moving Target. Written collaboratively by Cecil Castellucci and Jason Fry, Moving Target is an adventure featuring Princess Leia Organa in the days after The Empire Strikes Back and not very long before Return of the Jedi. With its principal audience generally in the young adult section, Moving Target is a swift and fun read about our favorite space royalty. While framed from the time period of The Force Awakens with a droid pestering General Leia to record her memoirs, the novel truly begins with Leia aboard a rebellion ship, part of a small convoy dedicated entirely to protecting the famous rebel and keeping alive one of the greatest living symbols of the Rebellion from the Galactic Empire. After a disastrous escape from an Imperial attack, Leia is recalled from her protective exile to a meeting of the rebellion’s leadership, including the likes of Mon Mothma and Admiral Ackbar. At this meeting we truly grasp our time frame as the efforts of Bothan spies is revealed, the construction of a second Death Star. Leia, invigorated at the prospect of being more than just an icon, volunteers a plan to lure Imperial resources away from Sullust, where the rebel fleet will gather in preparation for an attack on the Second Death Star. 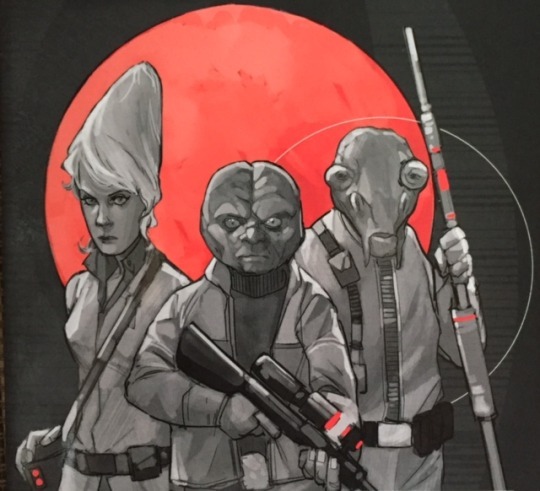 Our space-action princess ends up with a small team, the Sullustian smuggler pilot Nien Nunb, Kidi Aleri, a communications expert (human in appearance except for a coned head), Antrot a tech genius (an Abednedo – the fish-looking race who had a pilot among the Resistance fighters at Starkiller Base), and Major Lokmarcha, a rebel special forces veteran and member of the Dressellian race. Nien Nunb’s inclusion is interesting as there seems to be a concerted decision by the Lucasfilm Story Group to promote Lando Calrissian’s co-pilot in the Battle of Endor to a bigger status among the pantheon of heroes from the Original Trilogy. Since Disney’s acquisition, the Sullustian has played a prominent role not just in Marvel’s Princess Leia mini-series (referenced in Moving Target), but was also given an appearance in Star Wars: Battlefront – Twilight Company. The former smuggler might have also been given the boost because he’s one of the few Original Trilogy characters to reappear in The Force Awakens, albeit briefly as a Resistance pilot. In Moving Target, he’s quite the rogue and plays an essential role as part of the team with his personal star craft being the group’s means of transport. Aboard the Mellcrawler, Leia and her team set off for a remote side of the galaxy to deposit three beacons on three different planets. Set to transmit a general call to arms to those interested in joining the Rebel Alliance, the codes used in the transmissions are those recently cracked by Imperial ciphers and guaranteed to draw Imperial attention. It’s a ruse designed to sacrifice the well-intentioned of the three planets for the greater good of the rebellion and one that works. Across the said three planets, Leia encounters a variety of difficulties, be it finding a place to properly deposit her beacons to encountering a people intending to rise up against the Empire regardless of the consequences. Each planet is unique, though the level of interest the reader may have for each may differ. From our own perspective, the second planet, Sesid, suffers from too much of a dip into the familiar. Under the intent of blending in with the tourists, Leia ends up dressed in the galactic equivalent of a Hawaiian shirt and the writers slip in a chance to crack a joke about her future outfit while enslaved by Jabba the Hutt. It’s light hearted, but not truly necessary for the advancement of the plot or the development of any of the characters. It’s also on Sesid that the Empire truly catches up to Leia and her team and only the timely arrival of rebellion friendly pirates save them from capture or worse. On the final of the three planets, our rebels stop running and take on their pursuers. The main antagonist is Captain Khione of the Star Destroyer Shieldmaiden, who to the writers’ credit, is given enough attention to be interesting even if that attention did not extend to providing the captain with a first name. After Leia’s organized last stand against the Imperial forces on the third planet, her and the rest of her team are captured. Their captivity last long enough for Captain Khione to threaten to torture Leia, much in the same manner that Vader tortured her on the first Death Star, but a life giving sacrifice by her special ops veteran Lokmarcha gives Leia and everyone else time to make it to a shuttle to escape. An additional sacrifice, this time by the tech expert Antrot results in Nien Numb’s ship blowing up and taking out the Shieldmaiden in the process. Leia and her two remaining team members escape back to the Alliance, their mission a success. Leia’s team members have been given short shrift in this review and recap, which is unfair to them. Despite the short duration of Moving Target, each of the characters enjoy varying degrees of characterization and depth and avoid being simple caricatures with a few quirks to tell them apart. Leia, herself, is generally well written and feels like the Leia we know. Of our other Original Trilogy characters, such as Luke Skywalker and Mon Mothma, they come across similarly familiar. 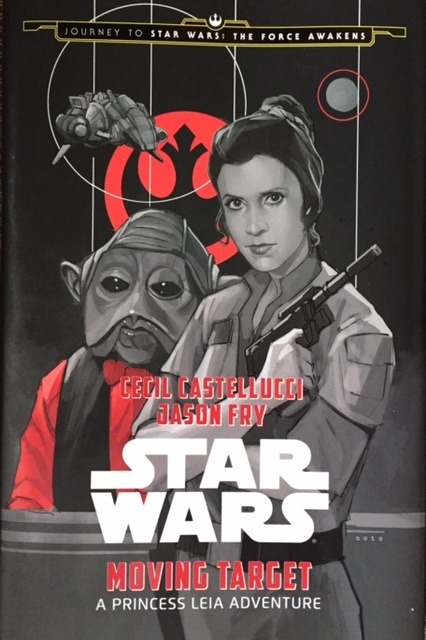 Moving Target is a quick and enjoyable read by Cecil Castellucci and Jason Fry and provides a glimpse of Leia’s adventures leading up to the rescue of Han Solo at the outset of Return of the Jedi. Of the three short novels, which use the framing of The Force Awakens to truly tell stories from the time period of the Original Trilogy, it receives the bronze medal in terms of enjoyment and interest. This isn’t a slam of Moving Target, as all three books are fun and worth the time of any Star Wars fan to leisurely peruse. It’s simply not quite as good as the other two accompanying novels. For those who are not passionate fans who must read every story, Moving Target may not be a necessity, but it’s worth one’s time if they do choose to pick it up.